Question: So why is high tensile aluminum alloy the best choice for high current mechanical connectors & lugs (screw type)? Answer: Aluminum alloy connectors costs about 25% that of copper connectors and can be used with both aluminum and copper wire ("dual rated"). Aluminum is easier to machine and can be extruded in complex design shapes including hollows with outside profiles which are different from the internal profiles. 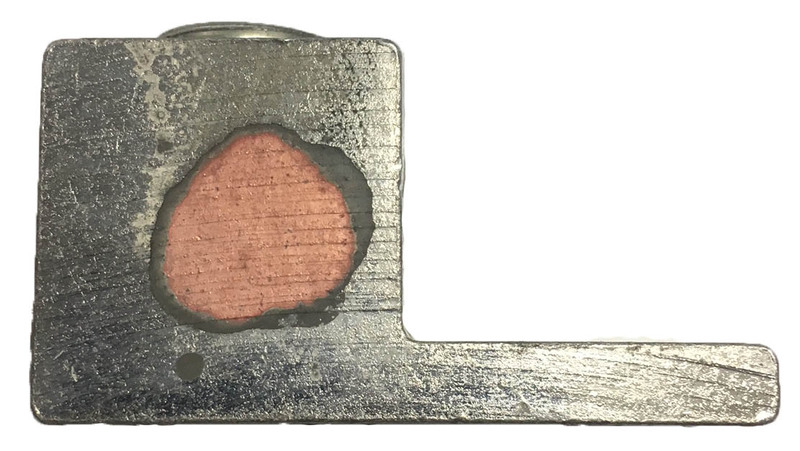 Cooling fins may be provided readily in aluminum extrusions but not generally in copper profiles which have to utilize even wall thickness tubing. Question: Why is an aluminum alloy connector up to 4 times less costly than a copper or brass one? Answer: Copper or brass material (bar or tube) costs about 2.5 times more than that of aluminum alloy per pound, and, due to the lightness of aluminum, aluminum is about 8 times less per unit volume! After compensating for aluminum alloy having a lower conductivity (40-50%) than that of copper (100%), the aluminum alloy cost advantage is about 75% off the cost of copper per amp conducted. Aluminum alloy has 50% more conductivity than brass and like brass, is readily machinable. Copper by contrast mostly has 20% machinability (C110 etc) which adds further to the cost of manufacture. Machinable copper alloys (C145, C147 etc) tend to be higher in cost and less suitable for forming complex shapes. Question: Why are copper connectors not generally compatible with aluminum wire? Question: Why does the aluminum alloy mechanical connector (screw type) also work well with copper wire? Answer: Copper wire has a lower rate of expansion and does not over compress itself under the screw of an aluminum connector. High tensile aluminum alloy connector bodies maintain enough elastic (spring) compression load on the copper wire to maintain contact pressure on the copper wire even when the aluminum connector itself may expand. Soft copper wire work hardens when compressed (unlike aluminum wire which does not harden) and so copper can resist creep better than soft aluminum wire. The aluminum alloy lug or connector provides for the "gas tight" joint needs of both copper and aluminum wire and are therefore UL/CSA "dual rated" meaning they can be used with either wire material, while maximizing cost savings. Question: What is done to prevent oxidation and corrosion of aluminum alloy connectors? Answer: Aluminum alloy connectors and screws are plated with both copper and tin so that direct contact of copper wire and aluminum is prevented. This prevents galvanic activity and prevents surface oxidation of the aluminum. Standard IHI aluminum wire lugs are copper + tin plated and dual rated for copper and aluminum wire and intended for dry locations only. Now IHI aluminum UL Listed and CSA certified lugs cover FLEX (flexible) fine stranded wire class G, class H, class I, DLO (Diesel Locomotive), class K (MTW, welding / battery wire) See Guide on Flex Wire.